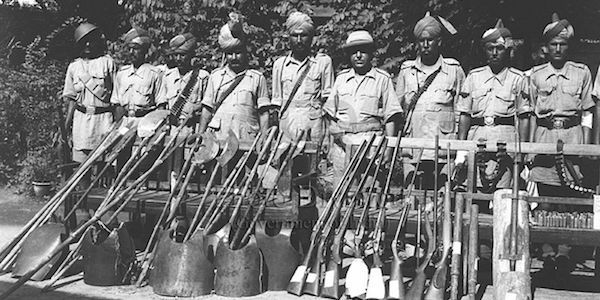 Whilst the legacy of partition remains etched across the Punjab and beyond, few have attended to the role of the servicemen as perpetrators of the violence as well as protectors, writes Saud Sultan. The 1947 partition of the Subcontinent divided Punjab into two parts – the West Punjab, belonging to Pakistan and the East Punjab, which became part of India. It was associated with massive violence within the six month time frame, large exchanges of population (approximately ten million), and significant involvement of the government in evacuating and protecting the refugees. The enforced movement of the Hindu, Sikh and Muslim populations of Punjab has been described as ‘on a scale absolutely unparalleled in the history of the world’. (Singh and Sharma, p.114). Around five-and-a-half million Muslims migrated to West Punjab, and around four-and-a-half million Hindus and Sikhs moved to east Punjab. (Ilyas Chatta, p.80) Violence is regarded as the main cause of the mass migrations that occurred in Punjab (see Talbot and Singh, p.66-67) and it became notorious in history as the ‘bloody battlefield of the Partition whereby far the greatest number of massacres of Hindus, Sikhs and Muslims occurred’ (Yasmin, p.07). “On both sides of the 35-mile-long road between Amritsar and Lahore, there were heaps of corpses. It appeared as if the entire territory had been converted into an extensive graveyard.” (Ian talbot, p.161). One of the main reasons for the violence was the communal tension in Punjab, especially due to the Sikhistan issue as Sikhs demanded an independent Sikh state. The Sikhistan issue is well known and adequately covered by academic literature (See Talbot and Singh, p.206 and Amrik Singh, pp.159-177) However, it is rarely discussed that what role did the servicemen, such as policemen, army and civil service officers, played in causing the violence in Punjab at partition. The servicemen are considered the protectors of a country as it is their duty to maintain law and order, and protect the country and its people from attacks. However, servicemen in Punjab perpetuated violence, instead of controlling it. This article will look at how and why they instigated the violence in Punjab. Guns and ammunition captured by the military and police in Paharganj during partition. Photo credit: Govt of India, Wikimedia Commons, Public Domain. The government officials were given the right to choose which dominion they wanted to join. The transferring of civil and public officers, such as Deputy Commissioners and other high officials who belonged to the respective minority community had an adverse effect on that community as they provided a sense of security in an atmosphere of communal tensions. With their departure, the officers of the majority community became hostile to the minority communities in some areas. The partition of Punjab was a tragedy that is remembered to date as it affected the lives of millions of people. The partition showed that when a country faces a major catastrophe, servicemen like police, army and civil service officers play a crucial role in maintaining law and order and protecting people in a country. However, if these servicemen themselves perpetuate violence then the consequences can be dire. As we witness a significant rise in hate crimes across India, it is imperative that the policemen and army in the country are not adversely affected by any forms of communalism, and carry out their role aptly and effectively. Saud Sultan graduated from the University of Cambridge with an MPhil in Modern South Asian Studies. His research interests include the Kashmir issue, the 1947 partition and India-Pakistan relations. Saud has done justice to this article and brought it out at time that is the month of Independence for Pakistan and India. This was a saddest part of the Indo-Pakistan History as it was very badly handled and the division itself as well as execution of its implementation was shoddy and dubious. The British in connivance of the Hindus plated a biased role resulting in an aftermath that the the two nations are reeling under to this day. It was never well intended nor seen as a harbinger of future togetherness among people who had their close ones left behind on either side of the divide. The leadership on both sides have eyed each other with suspicions and malice and despite the people to people desire to come together, it has been stony policies on both the sides. My advice to both the countries as well as Bangladesh (former East Pakistan) to sit down together and work out a peaceful solution and move forward as people sharing common history of over 3000 years and having the same culture, languages and bonds. From a four generation of military background that is my dream and I am willing to play a role in this regard. Well done Saud Sultan. Keep up the hard work Son. © 2011 – Văn Phòng Phẩm Nội&Phương.